AL DENTE is a line of pastas of POLMAK pasta manufacturer created for explorers of new flavours. Created exclusively on the basis of semolina, that is durum wheat flour. Due to large content of high quality gluten, after boiling semolina pasta is not sticky and remains AL DENTE. We squeeze it and form it in a traditional matrix made of bronze, so that its texture is rough and therefore it can perfectly absorb sauces and spices. 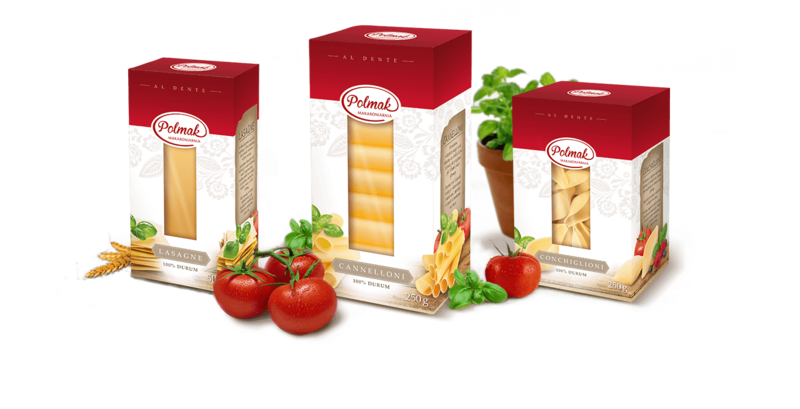 AL DENTE is a line of pastas of POLMAK pasta manufacturer created for explorers of new flavours. Created exclusively on the basis of semolina, that is durum wheat flour. Lasagne, Cannelloni and Conchiglioni are pastas used in Italian cuisine both as starters as well as ingredients of the main course. They are perfect with various stuffing types, baked with sauces or served cold. Lasagne, Cannelloni and Conchiglioni are pastas used in Italian cuisine both as starters as well as ingredients of the main course. They are perfect with various stuffing types, baked with sauces or served cold.